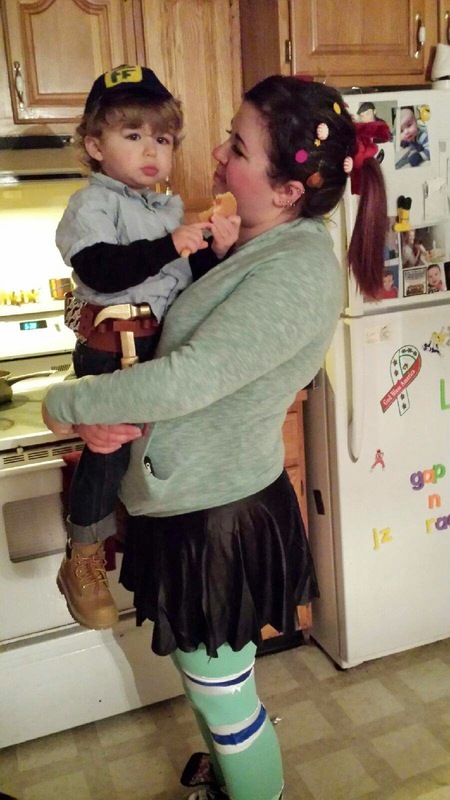 Happy Halloween: Costume Edition! 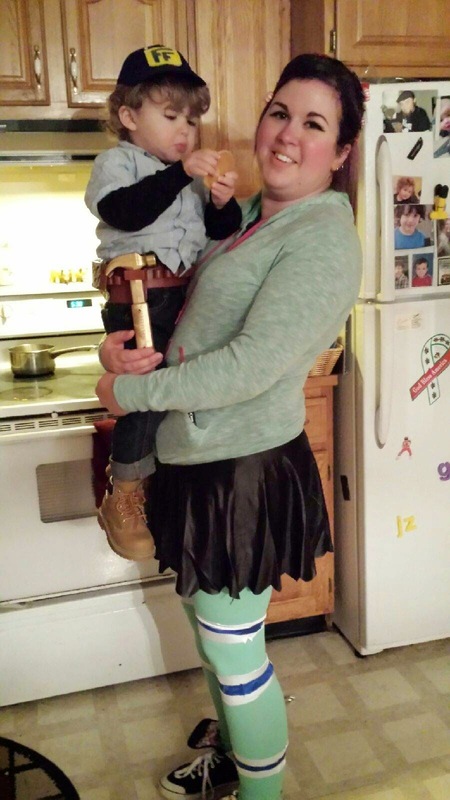 Wreck-It Ralph Costumes! Hey guys! I thought I would do a Halloween post to celebrate the holiday. 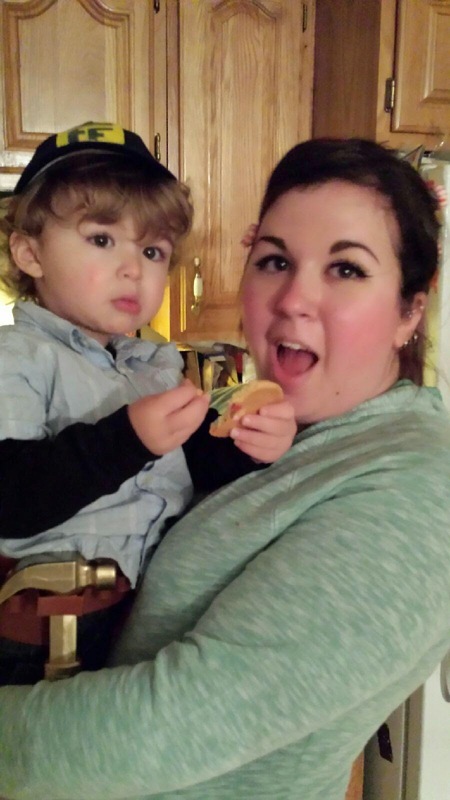 Halloween is my absolute FAVORITE and I always dress up. When I worked retail, I got the reputation from regular customers for being the fun one that dresses up for Halloween. Now, I'm finding that a lot of people are party poopers and don't dress up - my husband included. 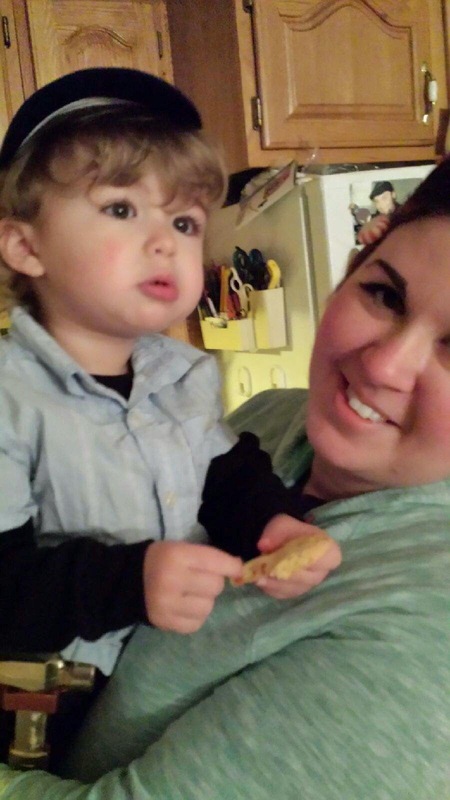 I had a grand plan of him being Wreck-It Ralph because I was Vanellope Von Schweetz and my son was Fix-It Felix Jr, but he wasn't into it this year, especially since we didn't know till last week if he'd have to work or not. 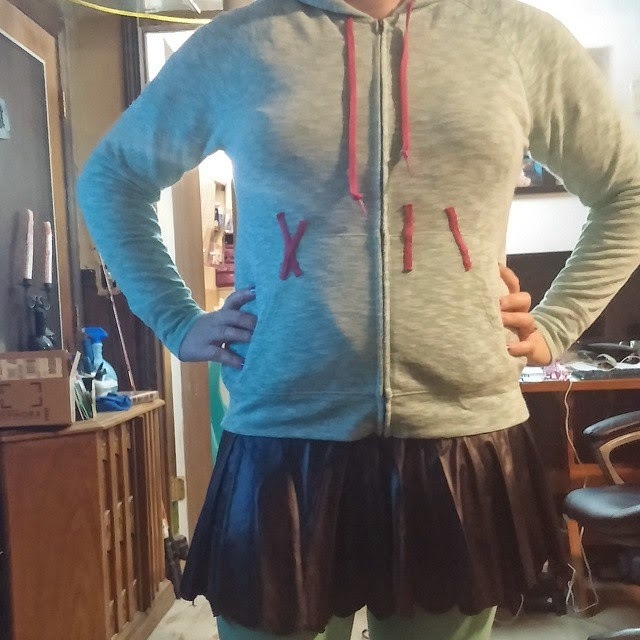 At any rate, I'm going to share with you how I put our costumes together and just some random fun! (Some pics are from my phone and some are from my DSLR, I was kind of switching back and forth throughout the night to whichever was easiest). Somewhat Cookie Monster inspired, I guess! 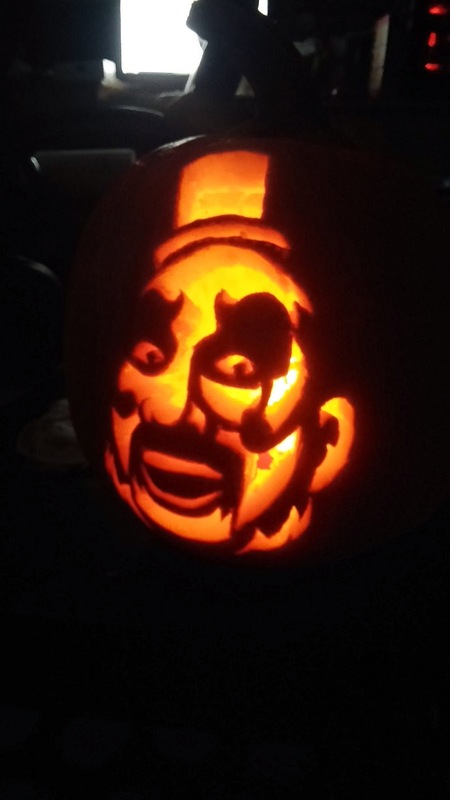 The one I carved was Captain Spaulding, from probably my favorite horror movie of all time, House of 1,000 Corpses. He had a sweater underneath his t-shirt because it was cold, but the t-shirt is just a light blue button up tee that I got off eBay for another $4. eBay is a Godsend when it comes to DIY costume supplies. The belt is a Home Depot kid's toy tool belt from Toys r Us. I believe it was around $15. It came with a bunch of tools that he'll have a blast with anyway, so I figured it was worth it. For the costume we just needed the hammer, and I spray painted it with metallic gold paint which I believe was $4 for the can at Home Depot. His jeans, again were from eBay. They were around $7. 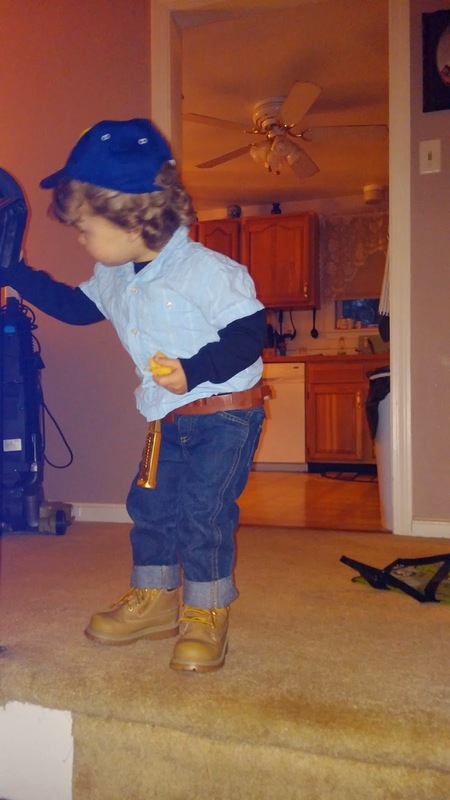 The boots were what I was most worried about, because I was adamant about having workboots for Felix, but they are SO expensive! I hate buying expensive kids' shoes because they outgrow them so fast! These were another eBay find, and I paid $11 for them. A steal, because they were brand new! I actually saw the same exact pair at Payless for $29.99, so I scored big time. It's great because he'll also get use out of them this winter! 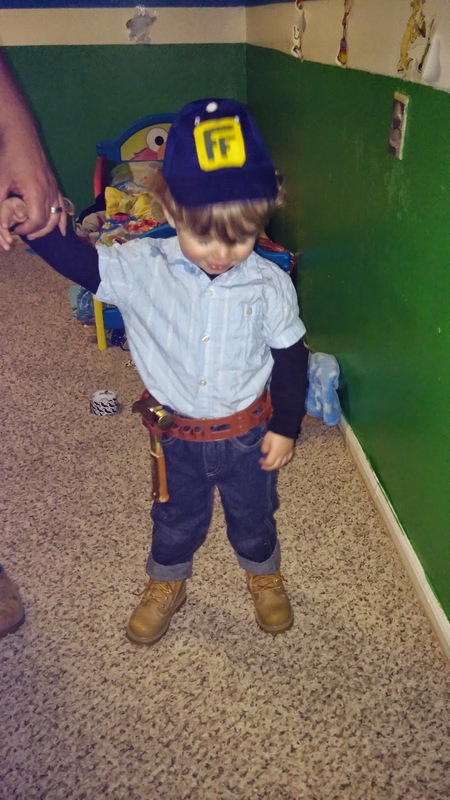 So there you have it, that's the Fix-It Felix Jr. costume and everything I used to put it together! Pretty simple. Vanellope's costume was a little more complex, so hopefully I don't forget anything. I'll start with the hair and makeup. For my hair, I put it in a ponytail and pushed my bangs to the side. She has a licorice hair tie, so for that I used a long strip of felt (this was actually one of my dogs' toys that she ruined lol!) I twisted it around itself and then tied it around my ponytail. 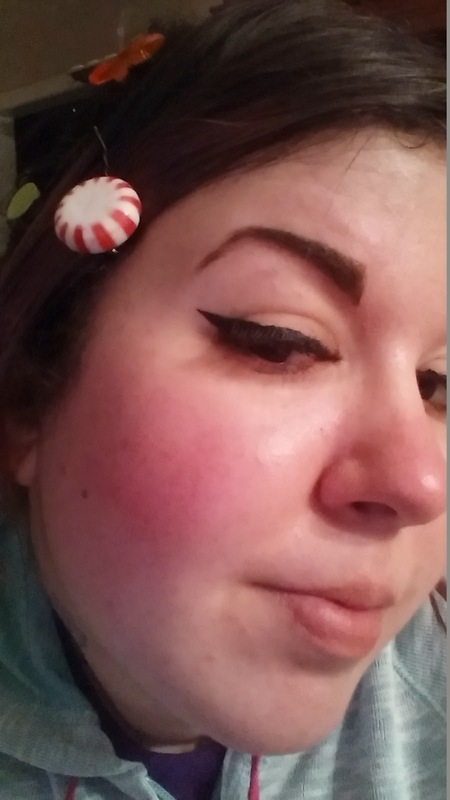 The hair candies were fun to make, and you have to get creative with it. I used peppermint candies that I coated in clear nail polish so they wouldn't be sticky, little clear plastic star shaped beads that I painted colorful colors with nail polish, heart and star shaped paperclips that I had, and different sized craft googly eyes (I painted the flat backs with nail polish colors as well). 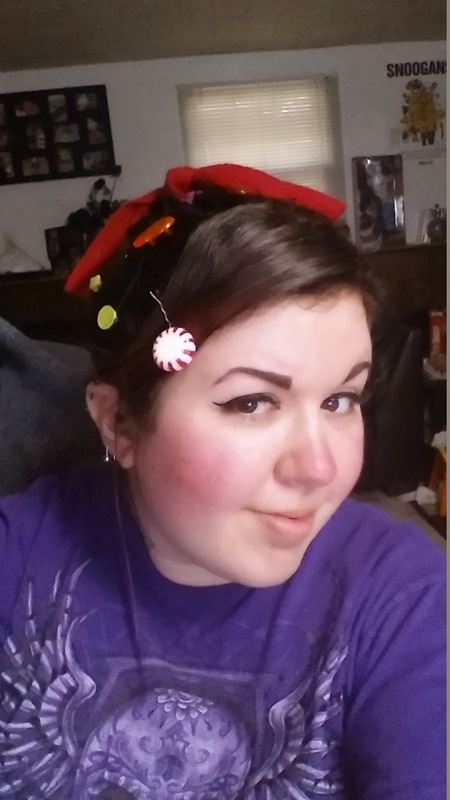 I took all of these bits and bobs and hot glued them to bobby pins, which is how I stuck them in my hair. For my makeup, I made my brows cartoony and sharp with the Anastasia Dip Brow Pomade. I did thick winged liner using the Urban Decay Perversion gel liner. When doing character makeup I like to use really pigmented blush to make it dramatic, so I used La Femme's Pink blush. I just applied it to my cheeks and the tip of my nose. I also used some false lashes from e.l.f. - I usually hate lashes, but I could barely feel these on! 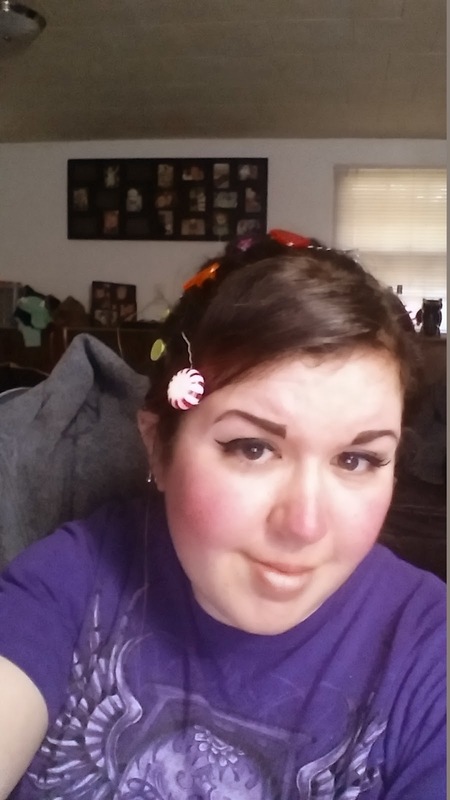 Vanellope doesn't have much else going on, so that's all I did for makeup! The hoodie was the first thing I found. I got it at Kohl's on sale for $11. It originally had strings that were the same color as the hoodie itself, so I replaced it with a pink shoelace. The little pieces are also shoeleace, cut up and sewn on in the same pattern that Vanellope has them on her hoodie. The skirt is from dresslink and was only about $4. It's nothing I would wear normally as it almost feels plastic-y, but for a costume it's fine! The leggings were the hardest part. First of all, you're not going to find Vanellope leggings, so you need to make them. It was literally RIDICULOUSLY HARD to find seafoam green leggings. I finally ended up finding a pair on Amazon and prayed they were the right color when they arrived. Luckily, they were. They were around $9 but I can always wear them, so it wasn't a big deal. 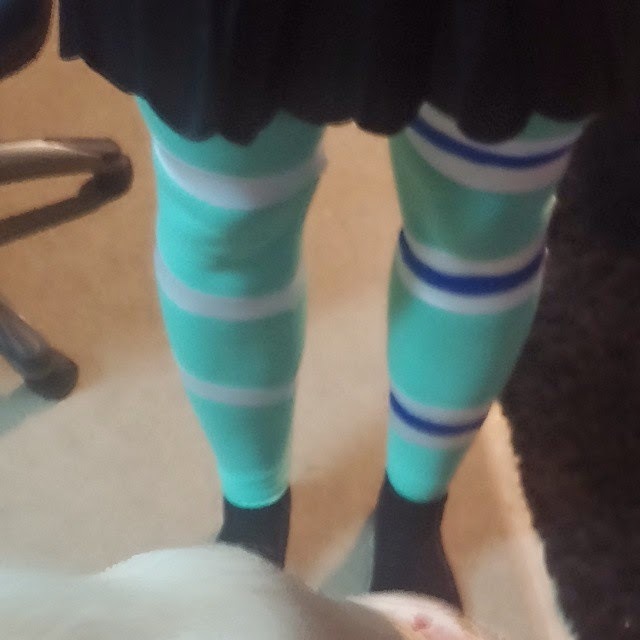 For the stripes I ordered cheap white and blue leggings from dresslink and cut them up. Then I hot glued the blue stripes to the white stripes for my left leg, and cut the white strips at an angle so they would be slightly angled on my right leg. You can't really sew material like this without it getting all puckered, so I just slipped the pieces onto my legs and wore them like that. Vanellope just wears black shoes, but I remembered I had these Kim Saigh designed Vans from forever ago, and they have candies on them, so I figured they would go perfect! And that is my costume! I really hope you guys enjoyed this post. I had a lot of fun all month putting our costumes together. I hope to do something fun like this again next year! Happy Halloween everyone! Thanks Lucy!! I did, hope yours was great as well!! I love how much thought you put into your costumes, and the fact that you made them yourself. 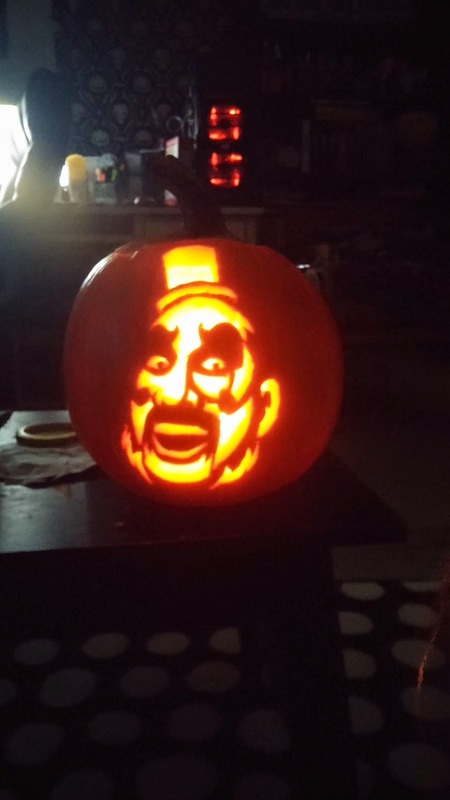 Oh my goodness, your Captain Spaulding pumpkin is simply all kinds of awesome! Thanks so much! I had so much fun putting them together. 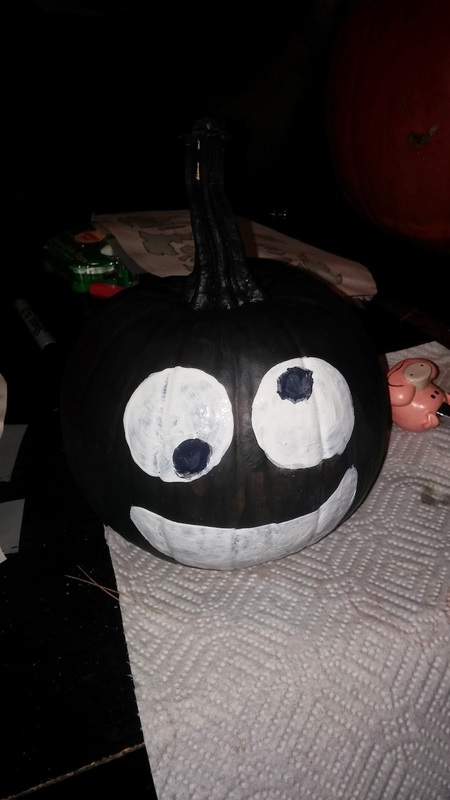 It's actually the first time I've ever made my own, so I definitely want to do it again next year!